There are over 1000 varieties of tomatoes. There are yellow low acid types all the way to the deep flavorful black tomatoes and everything in between. These plants are planted in a 4 inch cowpot that can be directly planted into the ground which minimizes any transplant shock. All plants are certified organic. The majority of the tomatoes selected for this year are heirlooms. 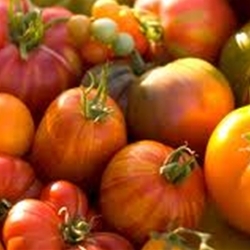 Heirloom tomatoes are varieties that have been saved and passed down through the generations. Heirlooms generally are lower yielding than modern hybrids. The thin skin that contributes to their flavor also means that they will crack more easily than thicker skinned varieties. Despite these characteristics, you will not find a better tasting tomato than an heirloom. Determinate varieties are bush types that grow to a certain size and then put their energy into ripening fruit. Fruits ripen over a more concentrated period of time allowing 1 or 2 main harvests which is particularly good for canning. Indeterminate varieties are the vining types that continue to grow until frost. They require more elaborate trellising methods to contain the large plant and more labor to sucker and prune. Select here for transplant information, pick up and order dates. I was excited to find this variety. This is a de-hybridized organic version of a traditional red beefsteak. These large tomatoes will slice up large enough to fit your big sandwiches. Flavor is nicely balanced. 1 lb. fruits. Indeterminate. Believed to trace back 100 years to the Cherokee Indians it one of the most popular black tomatoes. This heirloom is dusky pink with dark shoulders and excellent flavor. Medium large, flattened globe fruits weight 8-12 oz. Indeterminate. This variety is a more vigorous, higher yielding Brandywine type. Excellent flavor. Deep pink tomatoes are slightly smaller than Brandywine at 8-16 oz. Fruits have lots of deep, acidic tomato flavor and a rich creamy texture. Indeterminate. An early, prolific, golden cherry tomato. 15-20 gram round cherry tomatoes have a deep yellow color. The flavor is well balanced and delicious. Determinate. Fruits are 4-6 oz, smooth and globe shaped with rich flavor. Excellent red slicing tomato. Semi-determinate. Rivals Brandywine for taste. Deep pink and smoother than Brandywine, Rose is every bit as meaty and flavorful. Fruits weigh 10+ oz. Indeterminate. First developed in 1934 by Rutger's University in cooperation with Campbell's soup for the New Jersey canning industry. No longer a commercial standard, it is still well loved. Bright red fruits average 6-8 oz with a small seed cavity and good color. Hearty tomato flavor and meaty texture. Good for canning or slicing. Determinate. Classic Italian roma paste tomato. Tall vines produce long cylindrical fruit. Delicious balance acidic flavor and meaty flesh makes for good sauce. Indeterminate. Intense fruity flavor. Exceptionally sweet, bright tangerine orange cherry tomatoes. Fruits are 15-20 grams. Indeterminate. The name says it all: super sweet red cherry tomato with high sugar content eaten right off the vine. Sets masses of 1-1.5 inch round cherries in long clusters throughout the summer. Ideal for eating fresh, in canning, salads or relishes. Fruits are 0.5-1.0 oz. Indeterminate. Bright yellow 4-6 oz fruits are smooth and blemish free. Flesh is meaty, mild and acid free. Excellent fresh for salads, sandwiches or to add a splash of color to salsas. Determinant.